Blessed Alexandrina received a series of messages from Jesus in 1935. He warned that a second world war would take place as a punishment for the sins of mankind, and said the war could only be prevented by the consecration of the world to the Immaculate Heart of Mary. Jesus urged Alexandrina, through her spiritual director, to petition the Pope to perform this consecration. He also requested she pray and offer her sufferings for this intention. In September 1936 Alexandrina’s spiritual director, Father Mariano Pinho, wrote to Cardinal Pacelli (the future Pope Pius XII) regarding the consecration. In 1938, Father Pinho preached a retreat to the bishops of Portugal. At the end of the retreat the bishops petitioned the Holy Father to consecrate the world to the Immaculate Heart. Beginning in October 1938, Alexandrina experienced the Passion of Christ in a state of ecstasy every Friday from midday to 3 p.m. These ecstasies took place about 180 times, until March 27, 1942, the Friday before Holy Week. On Holy Thursday, Alexandrina felt sure that she would not experience the Passion ecstasy the next day. On Good Friday, Jesus told her the reason: Pope Pius XII had decided to consecrate the world to the Immaculate Heart of Mary. The Holy Father performed the consecration on Oct. 31, 1942. According to Sister Lucia of Fatima, this consecration helped to end the world war. Because of the influence of some detractors, Father Pinho was ordered to stop being the spiritual director of Alexandrina, and he was sent to Brazil, where he remained until his death on July 11, 1963. Sister Lucia of Fatima wrote a note on a holy picture to Alexandrina, ensuring her of prayers for a new spiritual director. Sister Lucia’s close friend, Father Umberto Pasquale, became the spiritual director of Alexandrina in 1944. He invited Alexandrina to offer some of her prayers and sufferings for the salvation of youth. She became a Salesian cooperator and prayed especially for youth. In her final years, Alexandrina prayed much for the Church. She constantly told people to practise the First Saturday devotion and to consecrate themselves to the Immaculate Heart of Mary through the Brown Scapular. Alexandrina was beatified by Pope John Paul II on April 25, 2004. This entry was posted in Fatima on October 11, 2013 by fatheranthonyho. Blessed Alexandrina Maria da Costa (1904-1955) was a mystic and a victim soul. She was called the “fourth seer of Fatima”. The victimhood of Alexandrina began on Holy Saturday 1918. Alexandrina and two other girls were at home when three men broke into the house to molest them. Alexandrina escaped by jumping from the window. She fell twelve feet on to hard ground, and came back to the house with a piece of wood to defend the other girls. The man fled, but the spine of Alexandrina was irreparably injured. At the age of 20, Alexandrina was completely paralyzed and became bedridden. At first Alexandrina prayed for a cure, but later she realized that suffering was going to be her vocation. She also realized that Jesus was a prisoner in the tabernacle, just as she was a prisoner in her bed of pain. Alexandrina begged Jesus to accept her as a victim and agreed to suffer as much as she could endure for the conversion and salvation of sinners. Alexandrina gave her consent to the invitation of Jesus, and she experienced a period of even more intense suffering. She experienced the attacks of the devil, and began to see terrifying visions and hear blasphemous cries. Satan frequently urged Alexandrina to end her suffering by committing suicide. Alexandrina overcame these trials by obeying her spiritual director. This entry was posted in Fatima on September 22, 2013 by fatheranthonyho. On July 13, 1917, Our Lady predicted that she would come to ask for the consecration of Russia to her Immaculate Heart. On June 13, 1929, Sister Lucia of Fatima had an important vision at her convent in Tuy, Spain. She wrote, “I had sought and obtained permission from my superiors and confessor to make a Holy Hour from 11 o’clock until midnight every Thursday-to-Friday night. “Being alone one night, I knelt near the altar rails in the middle of the chapel and, prostrate, I prayed the prayers of the angel. Feeling tired, I then stood up and continued to say the prayers with my arms in the form of a cross. The only light was that of the sanctuary lamp. “Suddenly the whole chapel was illuminated by a supernatural light, and above the altar appeared a cross of light, reaching to the ceiling. In a brighter light on the upper part of the cross could be seen the face of a man, and his body as far as the waist; upon his breast was a dove of light; nailed to the cross was the body of another man. “A little below the waist, I could see a chalice and a large host suspended in the air, onto which drops of blood were falling from the face of Jesus crucified and from the wound in His side. These drops ran down onto the host and fell into the chalice. “I understood that it was the Mystery of the Most Holy Trinity which was shown to me, and I received lights about this mystery which I am not permitted to reveal. “Our Lady then said to me: ‘The moment has come in which God asks the Holy Father, in union with all the bishops of the world, to make the consecration of Russia to my Immaculate Heart, promising to save it by this means. The vision is a summary of the essentials of our Catholic Faith, and the message from Our Lady concerns the future of the world. In 1948 Sister Lucia transferred from the Sisters of St. Dorothy to the Carmelite community in Coimbra, Portugal, where she lived out the message of Fatima as a contemplative nun for the rest of her life. Pope John Paul II, with the bishops of the world, consecrated the world and Russia to the Immaculate Heart on March 25, 1984. Then, in the fall of 1989, the collapse of communism in Eastern Europe began. “With whom?” asked Mother Celina. This entry was posted in Fatima on September 16, 2013 by fatheranthonyho. On May 13, 1917, Our Lady said to Lucia, “You will have much to suffer, but the grace of God will comfort you.” Within a few years of the apparitions, Lucia experienced the sadness of loneliness. After the death of Francisco, Lucia’s father also died. He was a strong man, but within 20 hours double pneumonia suddenly ended his life. The health of Jacinta was worsening, and it was decided she would go to Lisbon for treatment. After the departure of Jacinta, Lucia went away and hid in a rocky cave to relieve her grief alone with God by shedding copious tears. Jacinta died on Feb. 20, 1920. The Fatima church bells began to toll. Lucia knew that the tolling must be for the death of Jacinta. She ran away to a lonely place and flung herself upon the ground and wept as if her heart would break. It was only towards nightfall that she returned home, her eyes red from crying. For a long time the sadness of Lucia seemed to grow greater and greater. When the cemetery was open, she would spend long hours sitting close to Francisco’s or her father’s tombstone. The bishop decided to send Lucia to a school at Oporto run by the Sisters of St. Dorothy. With a heavy and sorrowful heart, Lucia left Fatima on June 16, 1921. In 1925, Lucia joined the order of St. Dorothy. On Dec. 10, 1925, Our Lady appeared to Lucia with the Infant Jesus. Our Lady said, “Look, my daughter, at my heart, surrounded with thorns with which ungrateful men pierce me at every moment by their blasphemies and ingratitude. The infant Jesus told Lucia on Feb. 15, 1926, that people can go to confession on another day other than the first Saturday, provided they are in the state of grace when receiving Communion and have the intention of making reparation to the Immaculate Heart of Mary. — People blaspheme against the Immaculate Conception. — People blaspheme against her Virginity. — People blaspheme against her Divine Maternity, refusing to accept her as the Mother of all mankind. — People try publicly to implant in children’s hearts indifference, contempt, and even hatred for this Immaculate Mother. — People insult her sacred status directly. Our Lord also told Lucia that the practice of this devotion would be equally accepted on the Sunday after the first Saturday, when, for just motive, priests allow it. This entry was posted in Fatima on September 12, 2013 by fatheranthonyho. Blessed Jacinta Marto was deeply impressed by the secret of Fatima given on July 13, 1917. The first part of the secret was the vision of hell, the second part was the devotion to the Immaculate Heart, and the third part was the suffering of the Holy Father. The secret shaped the spiritual life of little Jacinta. To reassure Jacinta, Lucia said, “Don’t be afraid. You are going to heaven!” Jacinta answered, “Yes, I am going there, but I also want everyone to go there!” At times Jacinta would not eat in order to offer her sacrifice for sinners who eat too much. At her beatification ceremony in 2000, Pope John Paul II thanked Jacinta for praying and making sacrifices for the Holy Father. Our Lady appeared to Jacinta and foretold that she would go to Lisbon to a hospital, die alone, and be taken into heaven. The sins which lead most people to hell are sins of impurity. Luxuries have to be put aside. People must not be obstinate in sin, as they had been until then. People must perform great penances. 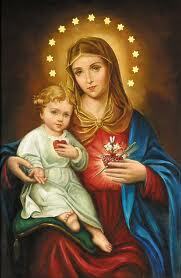 The Heart of Jesus wishes the Heart of Mary to be venerated at His side. Let them ask for peace through the Immaculate Heart of Mary, for God has given it to her. This entry was posted in Fatima on September 4, 2013 by fatheranthonyho. The last three weeks, the summer break for The B.C. Catholic, allowed me to spend time building a new website for my own Precious Blood Parish (www.pbparish.ca). I found that the process of building a website was valuable for me as a pastor, for it allowed me to look at all the areas of the parish and to reflect on what are really the most important things in parish life. The most important thing for each parish is the conversion and sanctification of the people. On the website I tried to bring out the message of the universal call to holiness with holy pictures. On the page about the parish children’s group there are pictures of young saints, including a photo of the three children of Fatima. My prayer and hope is that there will be saints among our young parishioners. I would like to invite you to visit our new parish website, and from there you can also find my previous B.C. Catholic articles on the apparitions of Our Lady in Fatima. These three weeks we are going to look at the lives of each of the Fatima children. Prayer, sacrifice, making reparation for sins, and praying for the conversion of sinners are the key messages of Our Lady in Fatima. Francisco seemed to focus more on making reparation through prayer, while Jacinta seemed to focus more on making sacrifices for the conversion of sinners. Francisco would then spend hours in hiding, praying before the tabernacle. When Francisco was very sick he asked Lucia and Jacinta to help him to recall his sins so that he could make his confession before receiving Holy Communion. The day after his confession, Francisco received Holy Communion. He said to Jacinta, “Today I am happier than you, for I have within my breast the Hidden Jesus. I am going to heaven, but there I will pray a great deal to Our Lord and Our Lady that they may take you there soon.” Francisco also promised not to forget Lucia in heaven. The next day, Friday, April 9, 1919, Our Lady took Francisco to heaven. This entry was posted in Fatima on August 24, 2013 by fatheranthonyho. During the apparitions in July, August, and September, Our Lady promised the children of Fatima that she would perform a miracle in October. Heavy rains had fallen from the evening before into the morning hours of October 13, 1917. Despite the heavy downpour, there was a massive crowd. On their way to the Cova da Iria, the children had to walk through the massive crowd. Many people begged the children to present their petitions to Our Lady. Upon arriving, Lucia asked the people to put down their umbrellas and to pray the Rosary. Then with a sad expression on her face, Our Lady said, “Do not offend God Our Lord any more, for He is already deeply offended.” The sorrowful look and sad tone of Our Lady remained vivid in the memory of Lucia until the end of her life. The apparition of the Holy Family is a call for the sanctification of families, and the apparition of Our Lady of Mount Carmel is a call to wear the brown scapular. Meanwhile, the crowd saw the “dancing of the sun”. The sun turned around and descended three times as if it were going to crash into the people. It gave off all shades of colors. Then the sun ascended back to its place, and re-descended three times. Thinking the end of the world had come, some cried aloud: “O Jesus! We are all going to die!” “Our Lady, help us!” Others begged for the forgiveness of their sins. After eight to ten minutes the sun returned to normal; the people found that their wet cloths and the ground had become dry. Many became believers of the apparitions on that day. This entry was posted in Fatima on August 6, 2013 by fatheranthonyho.